I’m not gonna lie to you…lots of people have said I ramble too much at the start of this lesson. It’s true! It was my first ever video and I was a little nervous! You can skip ahead if you like and get to the meat of the lesson. Either way check it out because these speed building and metronome practice techniques will massively increase your guitar playing speed if you use them. Have fun! Get Your Free ‘Play Faster Guide’ Featuring Full TAB For This Lesson Plus Bonus Exercises! DOWNLOAD YOUR ‘PLAY FASTER’ GUIDE NOW! Play Guitar Faster – Speeding Up Your Guitar Playing – Conquer fast guitar licks, speed up your guitar playing, improve your finger independence, fretboard hand strength, stretching and soloing ideas! 2:45 – 5 super important principles you need to know about increasing the speed of your guitar playing and how to practice building your speed. Starting slow, using a metronome, working on problem areas, making up your own guitar exercises and licks and more. Doing all of this will hep you to play guitar faster. 7:20 – 3 step action plan for building your speed and learning to play any lick or exercise faster. Use this in your practice routine and you’ll see great progress! You’ll probably see an increase in your playing speed in just a couple of minutes. Find your cruising speed – this is the speed at which you can comfortably loop the lick or exercise around. Then bump up the metronome speed and practice playing the lick once at this speed. Then play it twice, and when you’re ready play it 3 times. When you’ve got it try looping it round and round at the new speed. A good target speed for sextuplet licks is 120 bpm (beats per minute) on your metronome. 8:19 The minor pentatonic scale shape and Lick 1. This is in the style of Randy Rhoads, but it’s a very commonly played lick. It’s straightforward and easy to slip into your playing. Here you’ll see a demonstration of how to use the metronome to effectively increase your playing speed. 14:58 How to make sure your playing is totally in time. This is a super important guitar tip so check it out! 15:25 Lick 2 is a blues rock lick in the style of Slash, Zakk Wylde and many other great guitarists. How to use the metronome and 3 step action plan to increase the speed of this lick. 18:10 – Lick 3 is a great left hand hammer on and pull off exercise in the style of guitar players like Steve Vai, Joe Satriani, Randy Rhoads and most other modern rock guitar legends. The A minor lick is in 16th notes and will help you improve your finger independence, fretting hand stretching ability, and little finger strength and accuracy. Then see how to break it up into chunks, work on each section with the metronome to build your speed, before putting it back together to get a great guitar workout. A great target speed for 16th note type licksis 160 bpm on your metronome. Give it a shot! 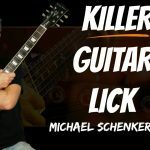 25:20 – Lick 4 is a great speed guitar lick using the A blues scale. It’s an awesome left hand hammer on and pull off exercise which will work great in a guitar solo. Break it up into chunks and perfect each part of the lick before adding them together for a left hand blues scale shredfest! 28:20 – How to integrate licks and exercises into your playing so you can use what you learn from your practice time. Get Your Free ‘Play Faster Guide’ (with Bonus Exercises!) Plus an Exclusive Members Only ‘Video Powerpack”!